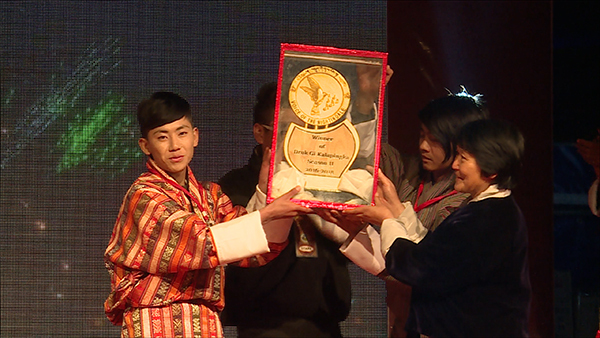 After entertaining viewers for more than two months, Kalapingka or the Voice of the Nightingale has ended with the crowning of Jigme Lhendup as the winner of this season. The grand finale of the popular singing show was held at the clock tower square in Thimphu yesterday where thousands showed up to root and cheer for their favorite singers. The crowd burst into applause and cheers as the show host announced Jigme Lhendup as the winner. 17-year-old Jigme Lhendup is from Trongsa. He is a student at Sherubling Central School. Along with the trophy, Jigme Lhendup bagged a cash prize of Nu 3, 50,000. “I didn’t expect to win,” Jigme Lhendup said. Yangchen Wangmo from Desi High School took the second spot. She walked away with a cash prize of Nu 2, 50,000. The third and fourth position holders, Sonam Wangmo and Kinzang Choden, took home a cash prize of Nu 1, 50,000 and Nu 1, 30,000 respectively. Karma Choden and Nidup Dorji came fifth and were given Nu 100,000 each. The Voice of Nightingale started on December 17 last year with 25 participants.